How Many Calories Do I Burn When I Bench Press? The amount of calories used while performing the bench press is unique for each individual. The bench press is a compound movement that involves multiple muscle groups to increase your muscle-building and calorie-burning potential. Knowing how certain factors and your training method play into calorie expenditure allows you to make an informed calculation of how many calories you use. Your age, gender and body size help determine your calorie expenditure during exercise. Then number of calories you burn decreases as you mature and your muscle mass decreases. The more the muscle mass, the higher the metabolic rate, which burns more calories. Body size plays a role in calorie burn as well. Heavier individuals burn more calories than lighter individuals. On average, men burn more calories than women, because they have a greater amount of muscle mass. Increase your bench press calorie burn by upping the intensity of your workout. For example, a 125-lb. person performing a general weightlifting routine burns 90 calories in 30 minutes. In comparison, the same 125-lb. individual performing a vigorous weightlifting session expends 180 calories in the same amount of time, according to the Harvard Health Publications website. Ways to increase bench press intensity are adding more weight, increasing reps and decreasing rest periods between sets. Another proven method of increasing bench press calorie expenditure is decreasing your rest periods between sets. According to the Body Chronicle website, a study performed by the Ewing College of New Jersey concluded that using rest periods of 30 seconds between bench-press sets burns more than 50 percent more calories during workouts with rest periods of three minutes. To burn more calories during and after training, which helps burn body fat, use a six- to eight-rep range and keep your rest periods short. An example of a beginner bench-press routine looks like this: press six to eight reps and do one to two sets with 30-second rests. 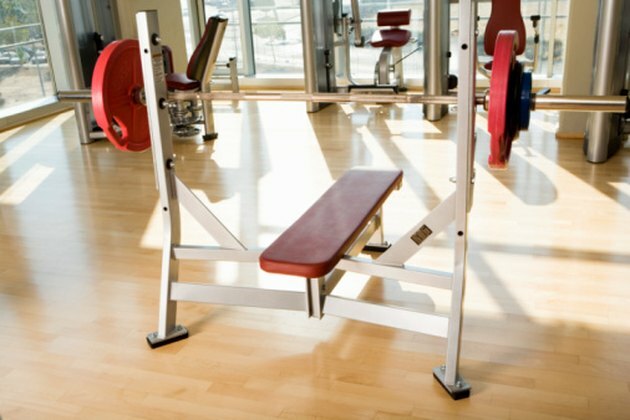 Calorie burn continues long after your bench press workout. A study published in a March 2002 issue of the "European Journal of Applied Physiology" found that individuals who weight train experience metabolic increases that last up to 36 hours post exercise. This increase is referred to as excess post-exercise oxygen consumption, or EPOC. How Many Reps Should I Do While Strength Training to Lose Weight?